Axumite, originally uploaded by eyobart. This is a painting I am working on about Axum, a historically indispensable town in Ethiopian history, religion and in fact of African Civilization as well. Axum is the place where the Queen of Sheeba reigned during the height of her empire, this where we have the Ark of the covenant and this is where we have the Axum Obelisks ( the ones I tried to put in my paintings as well). Axumite civilization still has a visible effect on Ethiopian history, religion, architecture and arguably political landscape. Currently, Axum is one of the most famous tourist destinations in Ethiopia.Traveling to Axum is one of the most inspiring things to me, both as my Ethiopian/African heritage and also as an artist. At this time, I am taking all the experiences I got from my last trip and integrating it into my art. The Cello Dream, originally uploaded by eyobart. Every morning when I wake up I feed human bread to the ducks outside my porch. When I don’t wake up and feed them they tend to scream at my window and disturb me very much. Amusingly, they give me inspiration. Their voices may sound raw and dreadful to many but remind me of a saxophone and the sound you get when you are manually ripping a piece of cloth. At the same time, other birds flee to this scene and sometimes rabbits and squirrels come. It gives me a child-like experience filled with simple and common fun that some take for granted. The Cello Dream was basically inspired by these bird encounters at my window. 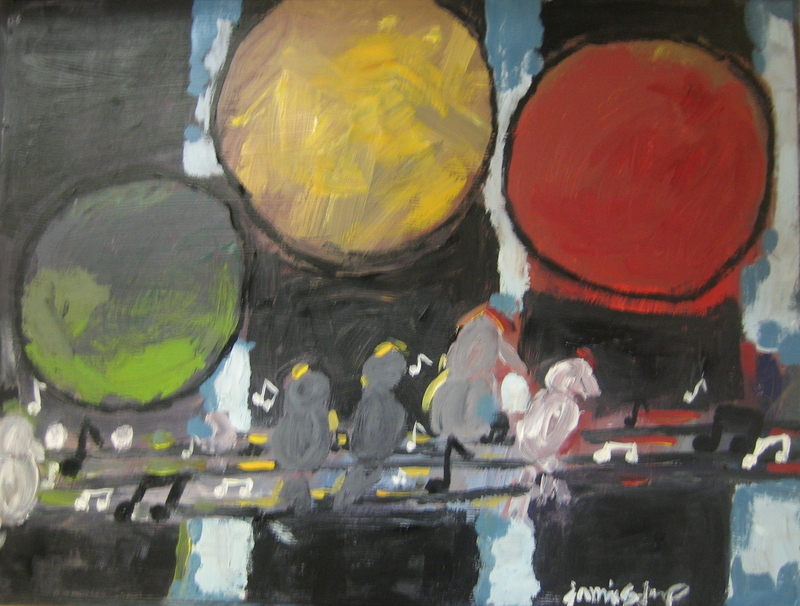 I took the song-like voices of the birds and depicted them as floating people under the moon. 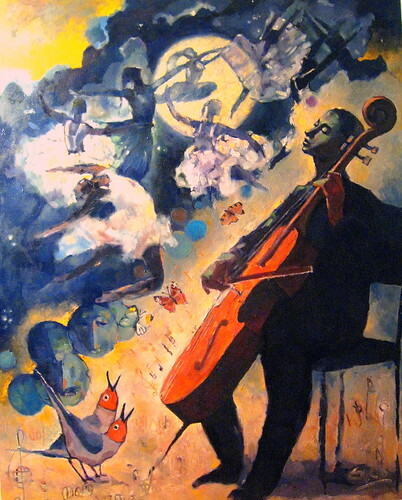 The songs of the birds merge with the cello player and his dreams of the full moon. I do many paintings like this because it helps my mind enter into a state of refreshment after a long and motivational art piece or set. After a loooooooooong trip to Ethiopia the last few months, traveling an adventurous and exciting trip across that great historical country, I am now back in town! The last few weeks, I have kept myself busy with the painting for the new Avera McKenna Hospice. I have actually used the knowledge gained from my trip in this work of art. Before I made my visit to Ethiopian churches, a lot of my inspiration was from mostly my imagination and sacred art. After my visit, some of my imaginative elements were confirmed and new ideas were raised. My art is delightfully taking a new turn towards a modernized dimension of Ethiopian art. By following and concentrating on the roots of Ethiopian art I believe my viewers will see a hidden and sacred language that cannot be spoken but seen in my art. Here is a brief description of the paintings. This painting is meant to represent baptism so as to symbolize Hope, the feeling of Healing and Salvation. It is meant to give a sense of comfort, sense of healing, sense of re-birth. Extending from the past through the present to the future, it is meant to guide the minds of people to explore the spiritual world in an artistic language and form both in the form of Water and Spirit as in the words of Jesus. Artistically, the spiritual elements representing different concepts radiating towards one universal theme, were depicted using dynamic composition. 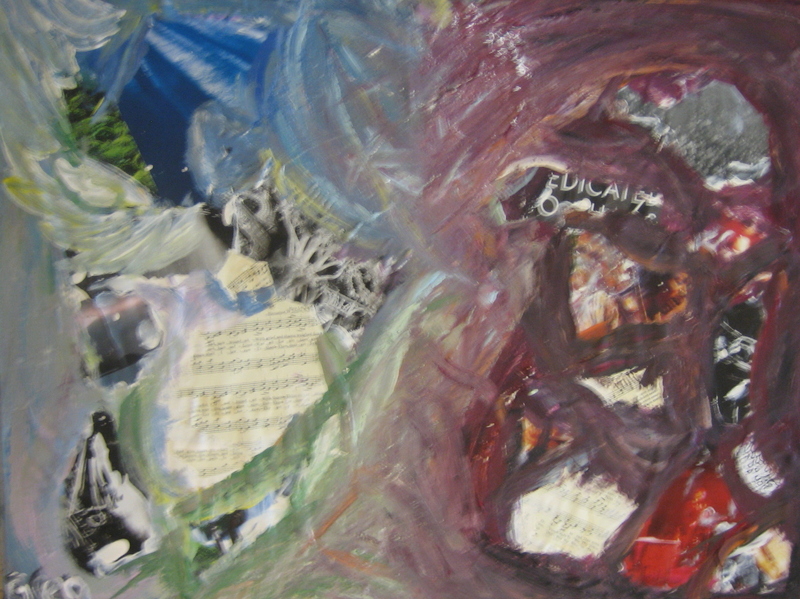 The blue painting is “born of water” and the red is “born of the spirit”. 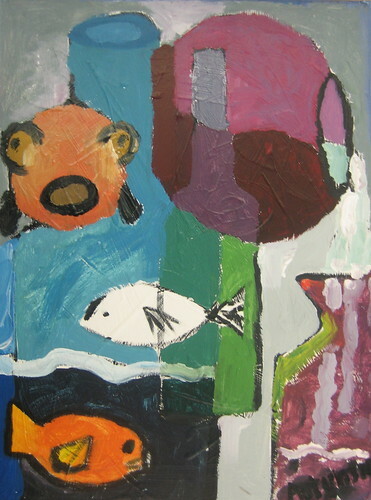 All in all, this painting is generally aiming to give cultural awareness from the perspective of art. Several elements are included in the two pentaplet canvasses. 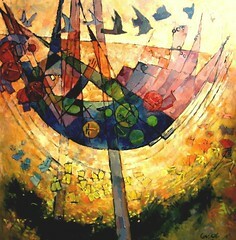 The Child symbolizes a sense of re-birth and represents baptism as in The New Testament; The Dove represents Spirit, The Ten Commandment represents the past (taking us back to the Old Testament) and the influence of which transcends to the present; the Umbrellas symbolize protection from the Sun. The ancient Cross icons symbolize the sacrifice Jesus Christ paid on the Cross for the salvation of humanity. All the above elements are chosen and included to give a sense of healing, hope and salvation for the needy! This show was a display of all the work done by the students. The show made for a nice evening for all of us. Surprisingly, their was reported more than 300 people that came to the opening. This picture was taken at the entryway of the high school with all of us together. Alpha Omega, originally uploaded by eyobart. Alpha Omega (Gr. "το 'Αλφα και το Ω), translated into Greek, means A to Z. Numerous people relate this to “the first and the last” or “the beginning and the end.” These few but powerful words are known to be appellation of God in the Bible book of Revelations. We gave this title to the project because we view it as the birth of a new concept. We were the first to discover and create this kind of concept in hopes that we were able to convey the mood and ideas of this theme. However, what ultimately unifies this project it is the representation of the life and times of Jesus Christ in our painting with modern and conceptual art. Tomorrow is actually going to be the day when the Mural is going to be hanging on the walls of SFC. The theme of the Mural is based on a Christian Art. 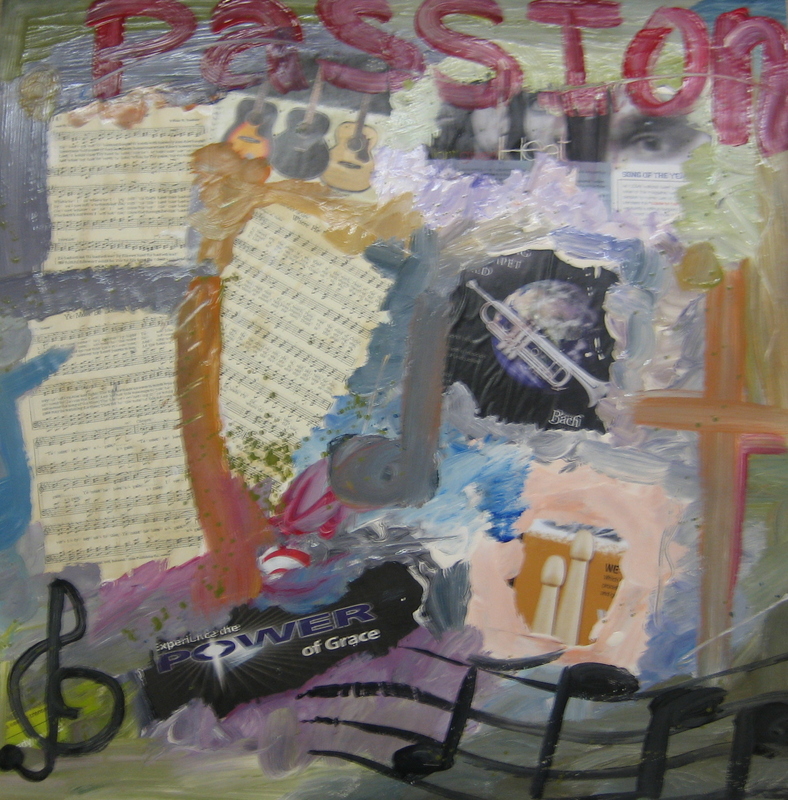 18 Students each created a piece by using musical notes, biblical verses to create a unified collage icon. They also have their individual designs and styles incorporated into their art. 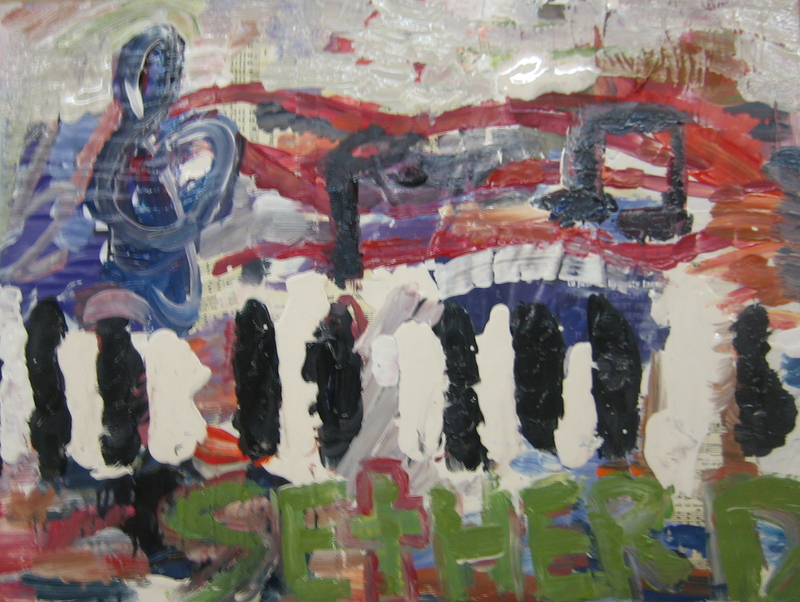 All the pieces are then arranged together in a form of a large cross in a triptych format. The color of sound art, originally uploaded by eyobart. 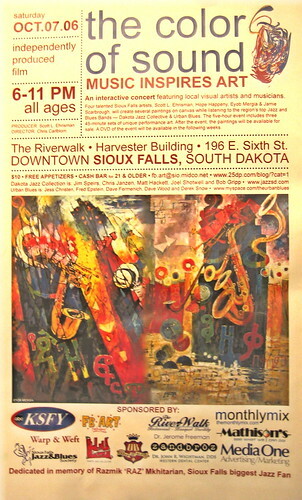 An interactive concert featuring local visual artists and musicians. 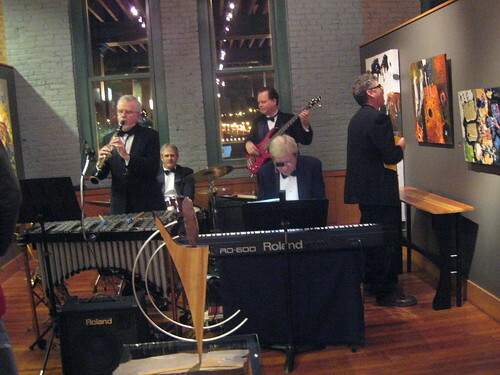 Four talented Sioux FAlls artists, Scott L. Ehrisman, Hope Happeny, Eyob Mergia and Jamie Scarbrough, will create several paintings on canvas while listening to the region's top Jazz and Blues Bands-- Dakota Jazz Collective and Urban Blues. This film will be very special for all of us! On Mayday, around eight o’ clock, I found an email that told me we needed to change the theme on our mural project from Jazz to Christian. 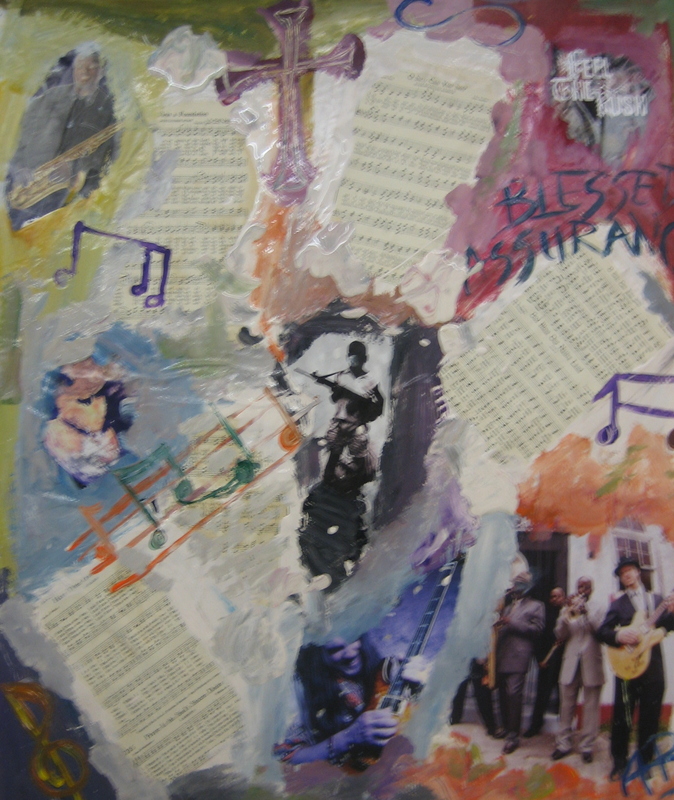 The Christian theme also was to have an emphasis on the bible verse: Psalms 150:3-5 "Praise him with the sounding of the trumpet, praise him with the harp and lyre, praise him with tambourine and dancing, praise him with strings and flute, praise him with the clash of cymbals, praise him with resounding cymbals. Let everything that has breath praise the Lord. Praise the Lord." 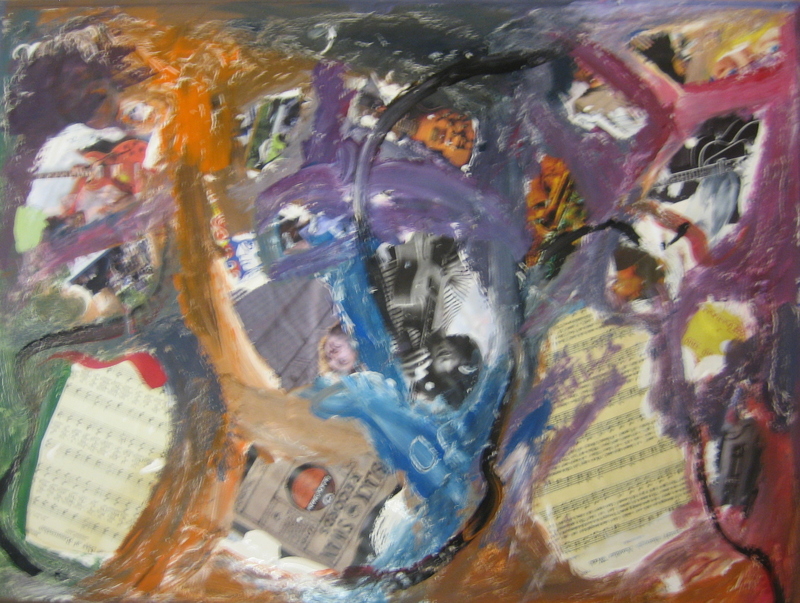 Luckily, we were ending our research about the Jazz concept in color motive and form instead of painting it. The reason why we needed to change the theme is because the SFC requested it so that the mural can be hung on the walls of the entryway. Thus, it would better suit the school’s Christian environment. I love the idea for the Christian theme but due to large amount of time that was given to us for the jazz theme, I prefer that better. 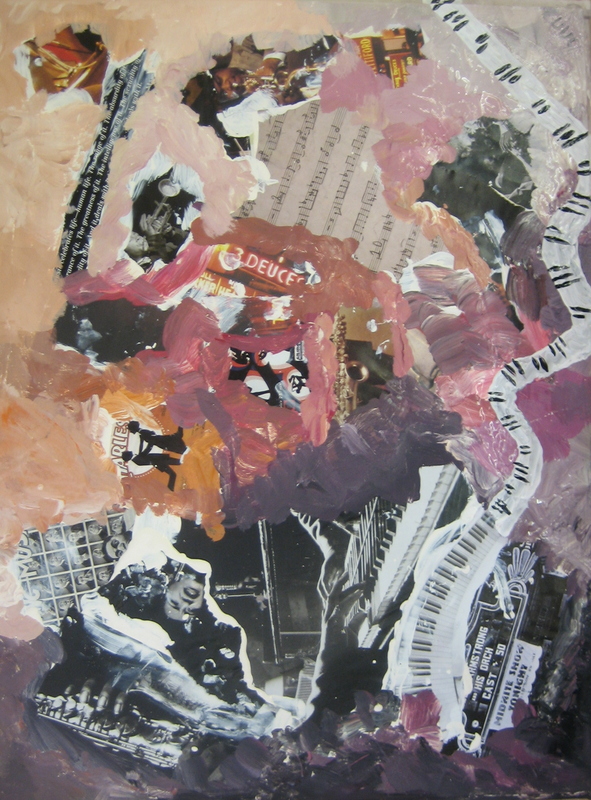 Time is crucial in art because with that you are able to research your topic and incorporate it in a beautiful way. 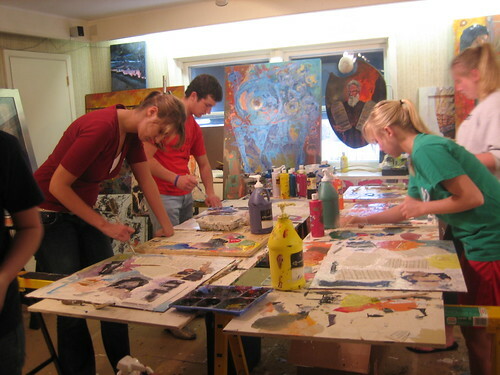 For a long time, the students started their paintings with a white background, glue, and paint. They used a collage system that started from black and altered to white. This gave them a sense of tonal gradation which gives them a better understanding in color. This time, I had the students start from the middle of the light brown and dark brown tonal gradations I had made. For example, the middle tonal gradation of black and white is gray. This gave them an opportunity to learn how to work with different tonal gradations of one color. In fact, this can give a project a monochromatic feel but still hold color as an advantage. What surprised me with the students visit today was the fact that all of the students came with an excitement and passion. We had the chance to work with mature, rich colors that represent Christian art but also themselves. 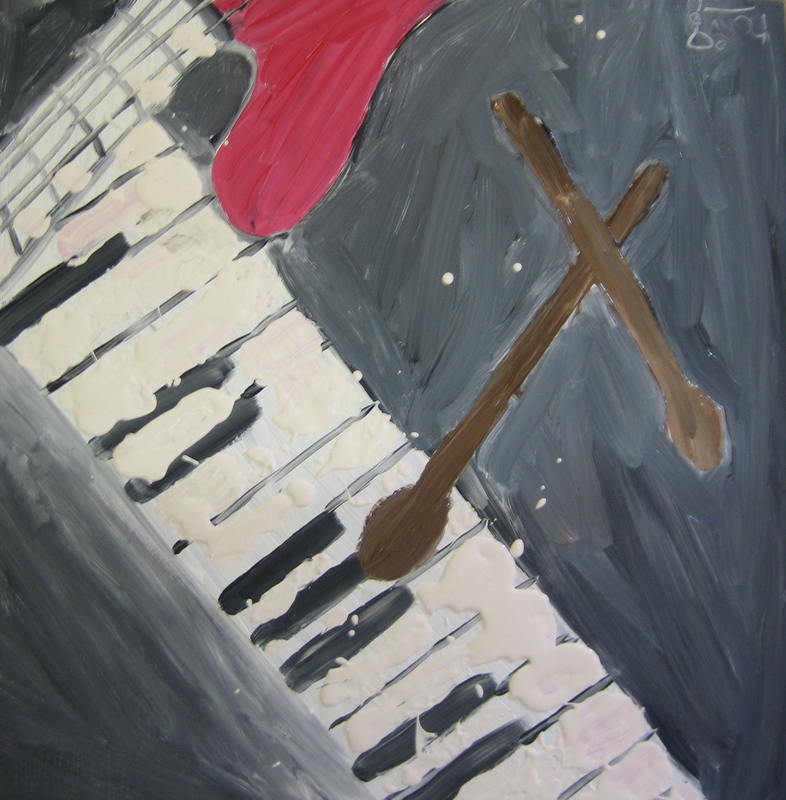 This differs from all the other work the students have done because it gives them a chance to take a common theme and symbolize that with their individual creativity. It was great as well as wonderful because half of the mural is so far successful. The third group that came into my studio were assigned to do a painting about children. My objective with the children art project was to unwrap up the creativity of the students and to unwind their minds. The students had a tricky time incorporating their ideas into the median that was given so we decided to adjust it. Nevertheless, I did not miss considering the artist side in all the students. When we changed the median, the students had a more comfortable time putting their ideas into the paintings. I myself appreciated their originality in this type of art. 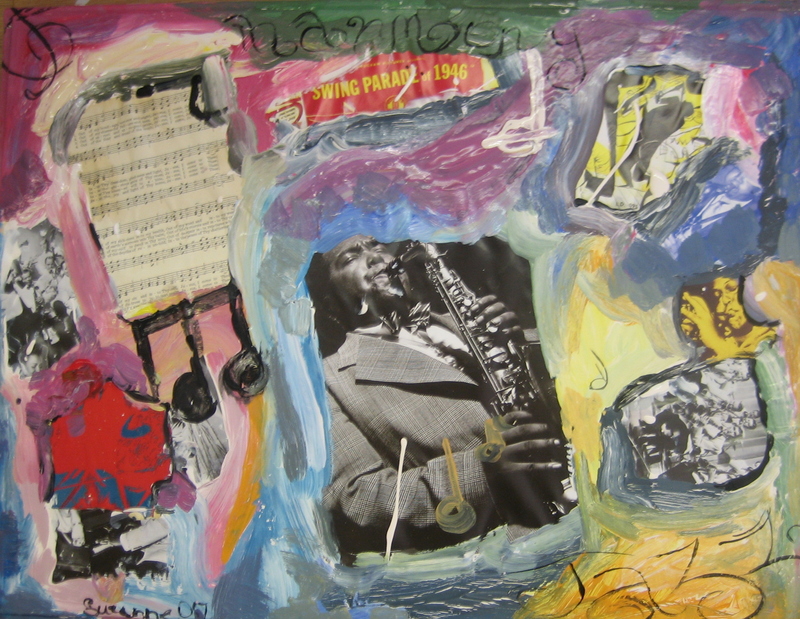 This group is doing a collage painting on Jazz art. They are the second group from Sioux Falls Christian Schools that I am working with. 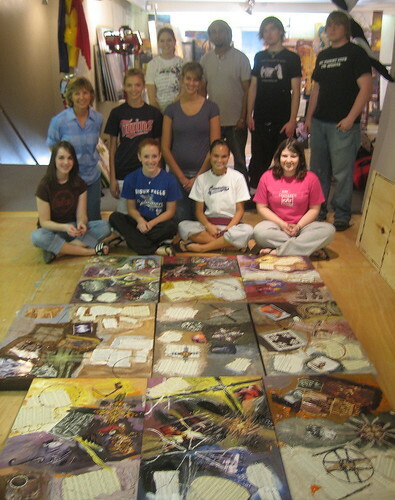 I was really fascinated with this group because they had so much originality in their pieces. They really surprised me! Some ongoing projects that I am working on right now is a mural project with some high school students from Sioux Falls Christian. 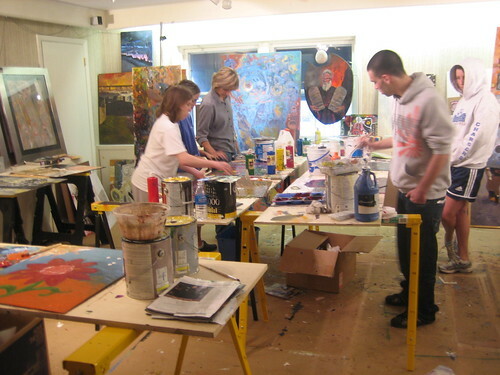 There are 18 students coming in as groups of six to my studio. My objective in this project is to educate the students about awareness of art. 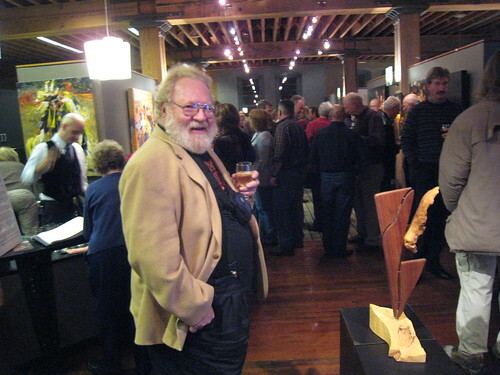 They are all diverse therefore I believe that they should all have diverse experiences expressing themselves in art. I am also working on breaking any preconceived ideas they have about art and open up their imaginations to original and exciting concepts. The three ideas I am introducing to the students are: life-paintings, painting from your mind, and the idea of subconscious painting. 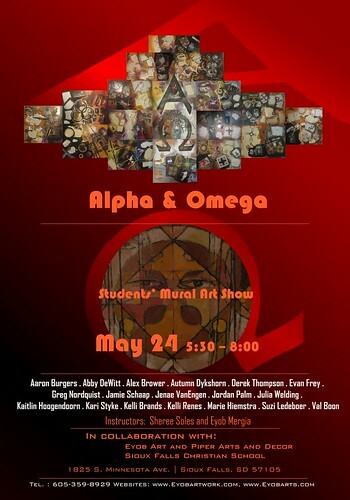 I believe that this project will not only influence the students at Sioux Falls Christian but the entire art community. They will be able to see the birth of a new concept in a student’s creativity and imagination. This project will profit the students in taking their eyes off of outdated concepts of art and steer their imaginations in new directions. This will not only assist them to see the vitality in expressing themselves but can add confidence in other areas of their education. 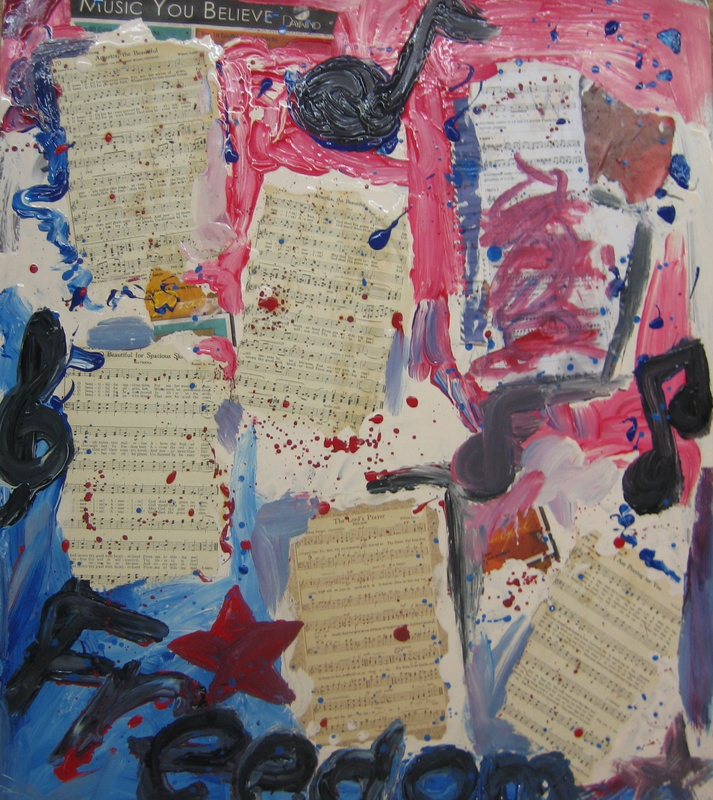 In return this will help the art community see the new era in art from the minds of our youth! Visiting dates from the students are listed as following. 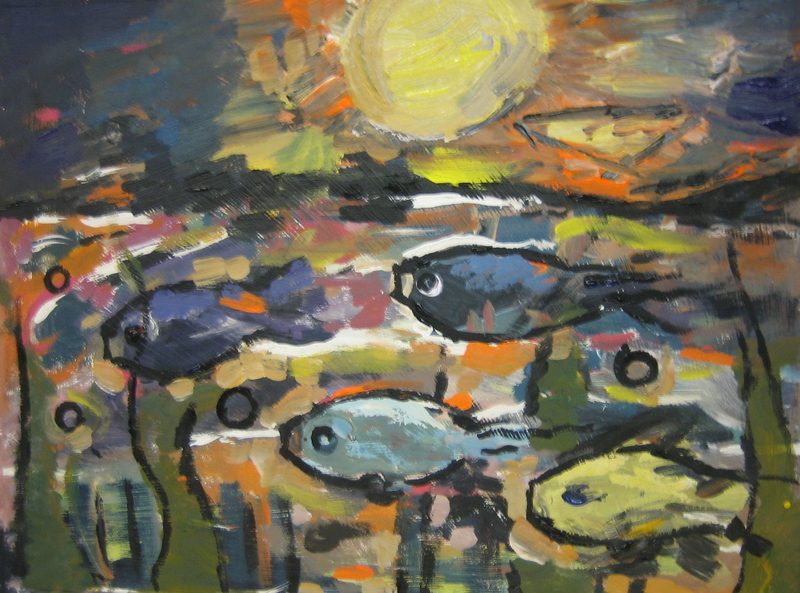 This painting was inspired by a friend of mine from the country side. Her family was moving to a big city and wanted a painting that reminded them of their home. We went to the country side to see how I could capture these memories. I did one painting about them and then another one about her. She grew up in the country side. It was a stunning time I had with her. The name "Swing" comes from the swinging she was doing when she was telling me of her country childhood memories. As I was listening to her I was looking at her and seeing her as a butterfly, bird, dandelion and more generally an important component in this universe. A challenging part of this painting was creating the motion-like-curve of the swing as I was combining the 3 dimensional ideas into one. I took it! One of the funniest things was, when I was doing this painting I observed not the painting itself but my color palette. I had an unusual amount of fun mixing the colors. In Edvard Munch's painting "Scream" . He made the echo of the women's scream have a unique relationship with her background which is defined by sound and figure. For some reason I was thinking about him and how it relates to my painting. It made me chuckle because in my painting there was a similar relationship like that which is defined by Bird and Butterfly. 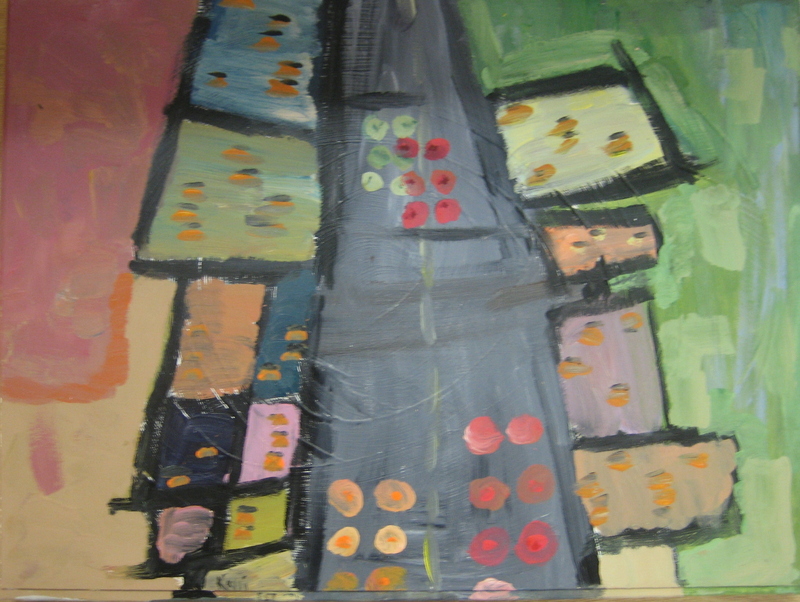 This painting was done by the end of 2005 and in a collection in Mitchell.